An important theme in my life the last few years, both personally and at work, has been to have the ability to help others. I know that it gives me immense spiritual satisfaction and a feeling of a higher purpose to be able to truly help someone. Whether the help is small or life-changing doesn’t really matter – what matters is that I get to be there for someone instead of being stuck in my own head and my own little plans and designs. This attitude is what made me leave my previous job, realizing I wasn’t making as big impact on improving lives as I’d hoped – and that was more important to me than the prospect of making a lot of money. That attitude was also what drew me to Singularity University and their challenge of improving the lives of a billion people – and might have had a little bit to say in me getting accepted, too. A couple of weeks ago I had the importance of helping others exemplified in a very very clear way. The event was scary and I realized in the aftermath that myself and my friends were being really stupid and put ourselves in great danger – however the events did give me a chance to truly see the power of being of help to others in action. For those of you who don’t know Half Dome it’s a spectacular mountain, and the hike up and down is estimated to around 12 hours. The path up is steep in the beginning, making its way up several impressive waterfalls. Then it flattens out a little, before getting gradually steeper until you make it to the base of the top. 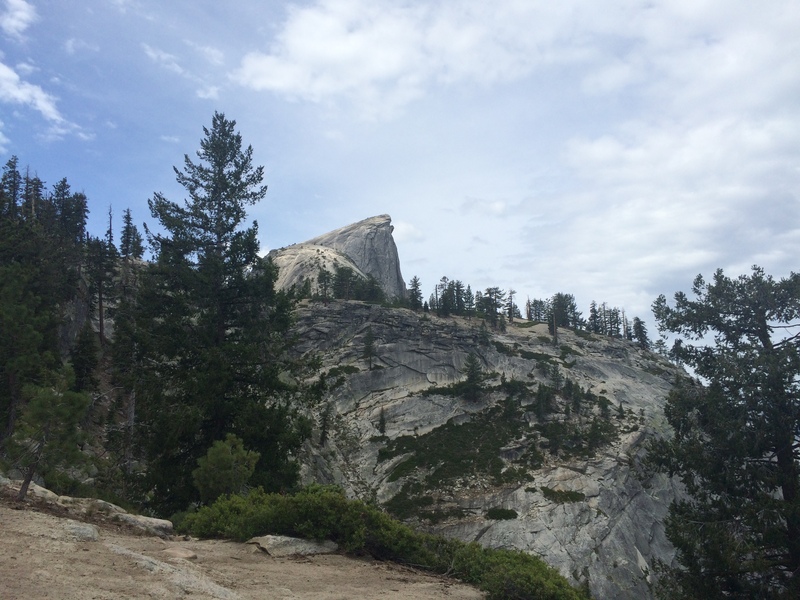 The top itself is a sheer granite rock. It was said by some of the early explorers of the region that Half Dome was the only mountain in Yosemite that could not be climbed by humans. When you put it like that, of course someone had to prove that wrong, which was done only 15 years later. Today there are metal cables bolted to the mountain side and occasional wooden “steps”, 3-4 metres apart. It can’t be said to be a safe way up, but at least it is a way up. However: there are big big plaques at the base (as well as on the top) saying if you see dark thunder clouds, or if there is any chance of rain at all, do not attempt to climb the mountain. I repeat: do not climb this top. Again, do not climb this mountain if it might rain or god forbid there is lightning. Well… We’d already hiked all the way. And when we got to the base of the final climb, we looked around. We gave it a thought. We saw a cloud, maybe two, okay maybe five, and they were only a little dark… Okay they were pretty dark. However they seem to be pretty stationary by another mountain, miles off. And it was really not that much left, we’d be up and back down in no time. Besides, these Americans have a tendency of exaggerating their safety features. We decided to make a go for it. How hard can it be, right? 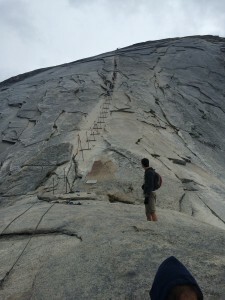 So we went at it: doing the steep climb up the shady ladder’ish construction, straight up the sheer granite surface up to the top. It was steep, it was a hard climb, my muscles screamed, but we swiftly made our way to the top. We had our photos taken, we enjoyed the spectacular view of the entire Yosemite National Park, as well as the intense cliff dropping on all sides of us. Truly breath taking! However, in the midst of all this beauty we suddenly noticed that the dark clouds that had seems so still just a little while ago, suddenly had started moving – and they were moving fast. Right towards us. We realized this was particularly bad news and decided to turn back down, making it to the base before any rain or thunder started. We had climbed down about one third of the full face of the top when the rain came over us for real. My first realization was that when they said it would be slippery if wet, I didn’t fully appreciate the extent of that sentence. Not only did my feet not have firm grip on the ground beneath them – my hands had an equally bad grip of the metal cables. Parts of the path was at perhaps a 75% incline. And these two now slippery points of contact were the only two preventing me from sliding off the face of the mountain, dropping hundreds of meters into the valley below. Further down the slope, a girl was now in full panic. Someone was trying to help her but she was screaming and sobbing in terror. I realized that she could die. I realized that I could die. One small mistake, one slip, and it’d be over. I felt how fear slowly crept up on me. And shaking doesn’t exactly make precise climbing down a slippery rock any easier. We never should have gone up. We were stupid and feeling immortal. We overestimated being lucky and “it wouldn’t happen to us”. In any case, here comes the point where I learned something valuable – the plot twist of the story. I was about to tell her that I was just as terrified as she was and that I didn’t have the faintest idea about how to survive this – but I saw the fear in her eyes. And I realized I could be strong. I could be there for her. And I could probably make my way down. I didn’t slip once. She did, once, but caught her grip before I needed to catch her. I would have, though. I held my grip, my arm wrapped around the thick metal cable – I held that grip not just for me, but for her too. I had to. I was needed. And, turns out, I was strong enough for the both of us when I had to. The moral of the story is clear: help others as much and as often as you can. Whether it’s offering a helping hand to a stranger, being there in a time of need for a close friend, or spending the summer at Singularity University starting a business that should improve the lives of a billion people – what matters is that it’s not about you. You may be scared, you may feel powerless, you may feel overwhelmed with the tasks ahead and think you can’t make it, but none of that matters when someone is depending on you. That attitude will get you out of fear and worry and into taking care of the situation, finding strength you didn’t know you had – and who knows, you might just save someone’s life. Also, don’t climb mountain tops in thunderstorms. Especially those with metal cables. That’s just plain stupid. The view was breath taking though!